I can now attest with tragic first-hand certainty, as the now former-owner of a butcher’s shop, that selling meat over a counter will not make you ‘filthy rich’ or even ‘not poor’. That said, Secrets of a Summer Night is sadly out of touch when it comes to a modern London butcher’s income streams. And not just butchers, for food retail in London has seen a creeping evolution over the last decade—and nowhere is this more obvious than in Marylebone. It struck me last week as I wandered along Moxon Street and then meandered south along Marylebone High Street, before finally finding myself in New Quebec Street that I couldn’t find any ‘food shops’ despite the preponderance of shops selling food. 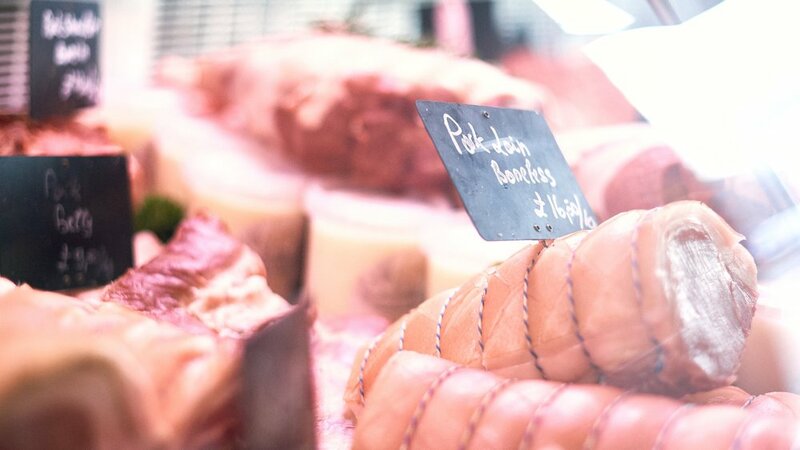 This might sound counterintuitive and indeed contradictory—Marylebone is, after all, feted as a food lover’s destination, resplendent as it is with independent butchers, fishmongers, cheese shops, greengrocers, delicatessens and wine merchants. None though are really what I would describe as ‘pure food retail’, selling only raw ingredients with which to construct meals, cooked at home. My father was born in the 1940s and brought up on an estate in Pimlico and has lived in London for most of his life. He was talking over Christmas of his childhood and, in particular, butchers. He remembers animals being delivered live for slaughter on site—maybe a cow, a pig and a couple of sheep per week. Slaughtered, butchered, sold. The whole carcass, butchered, would sit there until each morsel was sold, from the snout to the tail. How simple a business plan that looks now, when you are more likely to find a pulled pork sandwich or Moroccan lamb wrap to eat on the go than an ox heart or tripe with which to create a nutritious dinner. Similar examples abound: a cheese shop with attached wine bar, a fishmonger’s shop with fruit de mer platters and sushi to eat either on the premises or at home, a wine merchant housing a basement restaurant—all can be found in Marylebone today, and I’ll bet you a plate of delicious toro sashimi t’was surely never thus. In the course of finding out why this has happened, I spoke to lots of Marylebone business owners or managers and they all warmed my cynical heart. I had unfairly assumed that my questions would be met with defensiveness and disparaging comments about rents and business rates and a general ‘not like the good old days’ mentality that I alluded to in the previous paragraph. Not a bit of it—every single one was imbued with an almost effervescent positivity about the ongoing evolution of selling food. I found it incredibly inspiring, as I always do when I talk to passionate food people. Not one trader moaned about footfall or parking or any of the other myriad problems that make modern food retail so incredibly difficult, but were instead attuned to the change in their customers. This is something that I found out, possibly too late and certainly to my cost, when I opened my shop. I naively expected that people were as excited as me by seeing a gleaming array of fresh offal, skirt, belly and shanks as well as the more ‘accessible’ items. I imagined passing commuters popping in for some kidneys to devil for a delicious weekend breakfast or some ox cheeks for a warming weekday stew. What we actually sold was loads of chicken breasts and fillet steaks, and despite my very best efforts we just couldn’t get enough people to actually cook to make having a butchery counter viable. The same with our fish counter, which in the early days was swathed in glimmering fresh fish from Cornish day boats out of Newlyn—hake and turbot, mackerel and brill, megrim sole and line-caught bass, among many, many others—but then we just sold lots of salmon fillets and prawns. So, having frozen and eaten as much protein as we could, we then realised that we needed a menu, but we didn’t have a kitchen, an oven or extraction—any of the things that are required to cook food. We became ‘creative’—we had to—and we changed over a period of three years from approximately 80 per cent retail and 20 per cent prepared food to almost exactly the opposite. The ‘shop’ is now essentially a café/restaurant that sells a few groceries. And so it is in Marylebone—though not quite to that extent. 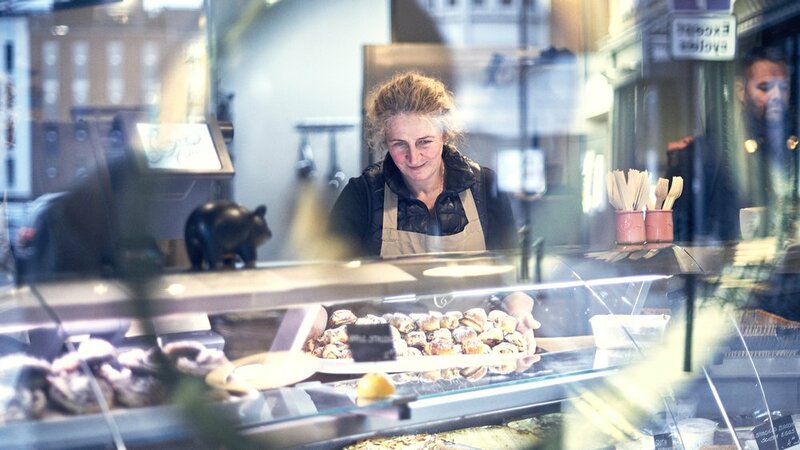 The utterly indomitable Nic Rascle of La Petite Poissonnerie has thought about this a lot. “In the 1950s people cooked meals from scratch,” he says. “Fishmongers used to close at 2pm because the housewives would shop in the morning; now we do 30 per cent of our turnover between 5pm and 7pm.” Opening hours are one thing, but perhaps more pertinent is his current sales mix. At his gorgeous shop on New Quebec Street, around 60 per cent of his sales are ready-to-eat food, as opposed to 40 per cent fresh wet fish. He puts this down to a lack of knowledge in how to prepare fresh fish, but also makes the fascinating point that in his other shop in Primrose Hill the figures are reversed because of a higher proportion of families buying their fish, as opposed to busy professionals and older couples who typically live or work in Marylebone. “They don’t like the smell of fish in these beautiful apartments,” he shrugs. Hence at Boxcar you can take a seat next to the meat refrigerator and pick your rib eye to be char-grilled over charcoal (you wouldn’t want that smell in a Marylebone flat...). You can sup on a decent rioja while someone else buys their sausages and chops, and after your boozy dinner you can pick up some bacon for the inevitable hangover. 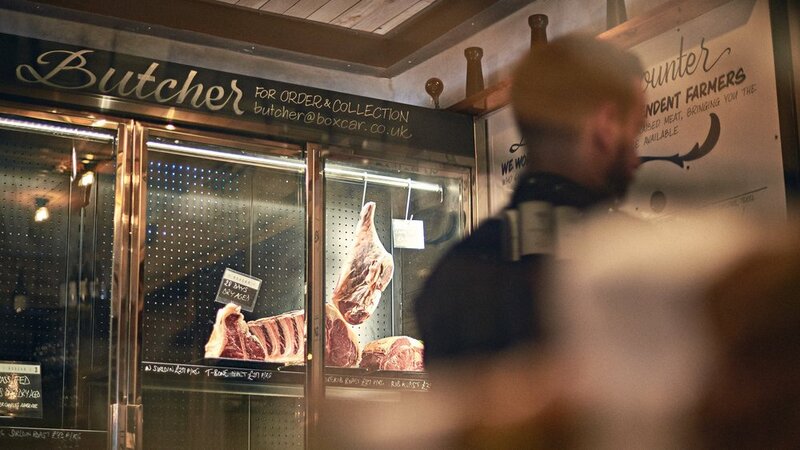 In terms of sales split, Boxcar is currently about 20 per cent butcher and 80 per cent restaurant, but Ricky fully expects the split to even out over time with the hope that dining customers will return as butchery clients. Food retailers add value to their bricks and mortar in other ways, too. Rococo on Moxon Street has a chocolate classroom downstairs, which hosts chocolate tastings and pairings. La Fromagerie lays on workshops and special dinners, and can be hired out for private cheese tastings. Sourced Market offers a packed schedule of supper clubs, takeovers, discussions and masterclasses. The Ginger Pig and La Petite Poissonnerie offer classes to teach traditional butchery and fishmongery skills—not only do these have the obvious advantage of putting money in the till, but teaching locals how to, for example, dress an oyster, prep a lobster or make a string of sausages will hopefully lead to increased retail sales as customers become more confident. Many businesses in Marylebone court the private chef market too, as well as branching out into event and office catering, offering specific preparations for premium ingredients and delivering it within allotted times. The key lesson that I learnt as a shopkeeper is that you cannot under any circumstances rely on people to walk into your shop, beautiful as it may be, and spend their money. You have to give them what they want; you have to utilise every part of the day; you have to make every square foot of real estate pay for itself by being creative and canny; you have to offer more than your competitors, push the boundaries of your license—and you must, must, must move with the times. With wine merchants like Le Vieux Comptoir offering a full food menu and cheese shops like La Fromagerie offering seasonal dishes from their kitchen and incredible cheese and charcuterie boards to eat in and take away, this is no trend—food and wine shops have changed for better or worse for ever. To combat online grocery sales, changing socio-economic norms and price increases on everything from grain to business rates, the shopkeeper of yore is now extinct. Arkwright, were he to open on Moxon Street tomorrow, would now have to add sushi skills or grocery masterclasses to his repertoire—being ‘open all hours’ just doesn’t, I’m afraid, cut it any more.